Elephants covering themselves with mud to avoid bad sunburns. The ear serves a important function in the elephant. It regulates body temperature and helps to perceive a threat. Although it supports and help regulates body temperature in both of the species of elephants, African elephants have a better effect. Due to their larger ears and the wide surface area of outer ear tissue, hot blood in the arteries is cooled as it filtered through the capillaries and veins. The skin of the elephant is not very thick except around the back and the sides. Their skin is very sensitive to the sun and most babies are covered by the mothers to avoid bad sun burns. To avoid and aid the issue, they tend to wallow in mud and cover themselves with dirt. With their skin comes plenty of protection and their tiny hairs located all over the body. The legs of an elephant have plenty of traction, but they weren't designed to move fast. Elephants can't run like other four legged animals, but they can walk for hours at a steady pace.The foot of an elephant is used to measure the overall size of a the animal,age, and the number of elephants in their group. Their spongy like shock absorber helps them to move silently and the sole of the foot is ridged and contains five toes which are buried inside the flesh of the foot.The brain of an elephant weighs about 11 pounds. Their brain is larger than any other land mammals and they are born with 35% mass of the adult brain. 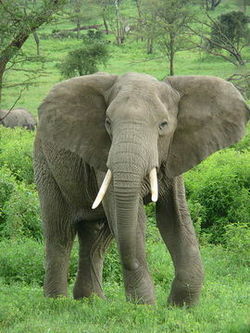 African elephants are the largest land mammals. Their trunk is an extension to the upper lip and nose and use for communication and handling objects. Their diet feed is mainly on leaves and branches from bushes and trees. They also eat fruit, grass,and bark. They vary on the time of the year and on rainy season they like to eat more on grass then the dry seasons. African elephant are rapacious eaters, thus determining their range. They are always searching for food and an adult male can eat about 300lb of food every day. In Savannas they gather in big herds roaming around in the lands searching for food or places to cool their body temperature. They are found in the African continent except for the desert region of Sahara desert. Mammoths were first described by German scientist Johann Friedrich Blumenbach in 1799. Mammoth lived in northern Africa. They were about 10 feet tall at the shoulder with long tusks and long reddish or yellowish hair. Many people think that Mammoth disappeared from disease, hunting and change in climate but it still exist as a mystery. Most mammoths were larger than elephants and if they had followed the elephants eating habits they would have been very significant beasts. Their diets consisted primarily of grasses, sedges and rushes. Mastodons were ancient giant elephants. They were smaller than mammoth. They were restricted to the North America continent and died out. They resembled a woolly mammoth and their tusks could grow up to five meters in length. Their teeth had blunt cones which were very different from other elephant families. Their skulls were larger and flatter than other mammoths. They were a big part of the Proboscidea order and still exist as a great history in the animal kingdom. 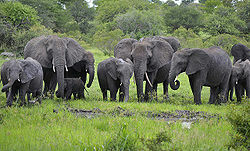 ↑ Introduction to the Elephant Species of the World Ecotravel. Web. Accessed January 29, 2012 Author unknown. ↑ 4.0 4.1 4.2 Elephant Anatomy . Elephant-world. Web. Accessed January 16, 2012 Author unknown. ↑ 5.0 5.1 5.2 The Trunk. elephant.elehost. Web. Accessed January 16, 2012 Author unknown. ↑ The feet . Elephant-world. Web. Accessed January 16, 2012 Author unknown. ↑ 7.0 7.1 The brain . Elephant-world. Web. Accessed January 16, 2012 Author unknown. ↑ Elephants. kidcyber. Web. Accessed January 17, 2012 Author unknown. ↑ Baby . elephant elehost. Web. Accessed January 17, 2012 Author unknown. ↑ 10.0 10.1 Adult.Elephant.elehost. Web. Accessed January 28, 2012 Author unknown. ↑ Elephants. Andrews-elephants. Web. Accessed January 27, 2012 Author unknown. ↑ African elephant. World Wildlife. Web. Accessed January 28, 2012 Author unknown. ↑ African Elephant. buzzle. Web. Accessed January 28, 2012 Author unknown. ↑ asian elephant. World Wildlife. Web. Accessed January 28, 2012 Author unknown. ↑ Asian Elephants. nationalzoo. Web. Accessed January 28, 2012 Author unknown. ↑ About Mammoths. ucmp. Web. Accessed January 29, 2012 Author unknown. ↑ Hirst, Kris.Mammoth and Mastodon. about. Web. Accessed January 29, 2012 . This page was last modified on 9 February 2016, at 15:52.